21-Jan-2005 -- We are a group of people that live for off-roading with our Mercedes Unimogs. The group are seasoned Altar desert veterans and I, personally, had already been there on one prior trip when we started planning the goal of conquering the 32N114W Confluence (DC). My friends Kai Serrano, Bill Caid, and Dan Johnson knew that the confluence would be in the middle of the “tundra”, a very bumpy terrain that makes driving thru very tiring, with "made good" speeds of 3 mph or less. The Altar desert is very unforgiving, to say the least, it is a remote and life threatening place if you do not take all the necessary precautions. You must go with a well prepared group with true off-road capable vehicles otherwise you could be facing big trouble. On our previous trip to the Altar Desert in November, we planned to go to the Confluence on January 20-23, 2005. The group was formed by Kai Serrano, Dan Johnson, Mike Bennett, Bill Caid, Kathleen Jones, Rob Pickering, Shane Pritchard, Frank Nesselhuf, Jose Antonio Aizcorbe, Alvaro Nieto and myself, Roberto Espinoza. There were a total of 4 Unimogs. We left San Diego on Thrusday afternoon and the plan was to go across the Calexico-Mexicali border, then go towards El Golfo de Santa Clara, use dirt roads until we could get to the dunes and from there go thru dune tops until we could get as close to the confluence as possible before getting into the bumpy tundra. We camped the first day at the beginning of the dunes as planned, we got there late at night. The second day, on Friday, we got to the place where a plane crashed some years ago, with debris field of plane parts scattered around a large area. What had happened here was bad, very bad and you could imagine the drama. We believe that the plane was used for smuggling drugs; why else would a small plane be flying so low near the border? After documenting the crash site, we continued our trip due east towards the confluence thru the dunes. Eventually, the dunes ran out and we had to reenter the tundra. That means very rough, very slow going, 3 mph tops. The tundra is inescapable. This is a very difficult terrain, something your kidneys will not forget soon. We got to the 32N114W confluence at sunset, we took the necessary pictures and then we moved to a close-by location to setup camp. The terrain is “flat” but full of mounds, that is why the group calls it “tundra” but flanked by huge rock mountains to the North, The Pinacate mountain to the far East, the Sea of Cortez of the South and sand dunes to the West and near East. The next day we proceeded again back into the dunes on a WNW direction to one of our most beautiful camps yet. The last day of our trip we went to the "death bowl" (you can get in, but you cannot get out), a Dodge truck had been abandoned there as it had rolled and was completely destroyed. From there we went to San Luis Rio Colorado by paved road where the group split, Rob Pickering took the highway towards Colorado, Bill Caid and Kai Serrano went towards San Diego thru El Centro and Roberto Espinoza and group went towards Mexicali and then to San Diego. The trip was a great experience, the confluence was achieved. We got time to play in the dunes. 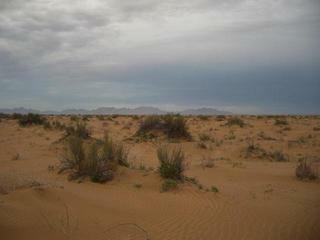 Best of all, the group had the opportunity experience the unforgivingness of the Altar Desert. You can look at the full trip report here .